Summer is almost incomplete without two things – pool parties and the soul-steering aroma of barbecued meat. The market is inundated with BBQ grills. While some of them are only designed for everyday grilling purposes, the tech-rich models are suitable for both steakhouses and family get-togethers. 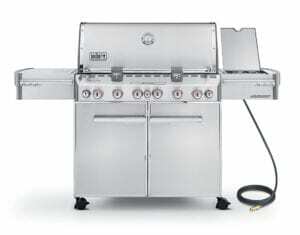 The tricky part is to get your hands the best possible grill that fits your cooking style, the available space for your grill to live, the amount of people you will be cooking for and the style of cooking that you like. Weber grills have been a grilling favorite for the past 60 odd years. 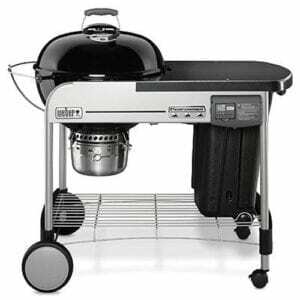 Sifting through the various models can be a bit of a challenge so I have handpicked a selection of 6 BBQ Weber grills for 2017 which should please everyone from the novice – newbie to the seasoned professional that loves to cook up a storm for the whole family. Weber is like the Apple of BBQ grills. Anyone who knows about grilling at all will tell you that their products are simply the best in the industry. Yes, Weber grills can be a bit on the pricey side, but they are still sold like hot cakes all over the world. With the perfect balance of using the latest technology and smart engineering Weber Grills are built to last and provide a host of features that others BBQ’s just don’t have. Weber has introduced the world to Flavorizer Bars. These apparently humble iron rods do an amazing job of adding additional flavor to the meat by catching the juices and vaporizing them into smoke to give an extra succulent, juicy smokey taste. From the old-school charcoal grills to the most up-to-date propane and natural gas models, Weber has a specific product designed for every budget and purpose. They mostly use stainless steel for constructing the shroud and frame of their grills with porcelain enamel coated steel for a lot of the body construction. This provides a durable finish that helps to withstand the effects of the weather and protect the unit against rust and accidental damage. So let’s get down to the nitty gritty and help you find your perfect Weber BBQ Grill for Summer 2017. This is Weber’s premium edition portable charcoal grill. If you love cooking over open fire and the charcoal-grilled flavor in your meat, this would be a great choice. The product has been mainly targeted at outdoorsmen, campers, and tailgaters. If you are buying a grill for the first time, I would recommend it. It is compact and the controls are really easy to use. You can use it on your lawn or at beach to prepare some tasty barbecue dishes. For a portable charcoal grill, the cooking surface area of 160 square inches is quite decent. You can prepare steaks, hamburgers and juicy pork chops for a group of 4-5 people in one go. Being made from porcelain enameled premium grade stainless steel, the burner has an amazing capacity to hold the heat. The heat is evenly distributed all over the grill to ensure maximum fuel efficiency. The grill burns piping hot in a real quick time. The same enamel coating also safeguards the grill against rusting and corrosion. The large built-in lid hangers shield the wind from extinguishing the fire in case you’re cooking outdoors on a windy day. Don’t worry about complicated assembly as the Weber Go-Anywhere Grill is almost ready to use out of the box. Just attach the handles with a screwdriver and you’re good to go. Grill cools down fairly quickly when the vents are closed. Easy to carry along on trips. Legs fold over to hold the lid on for storage and transport. It burns quickly compared to most charcoal grills in its league. But when compared to gas grills, it does take a while to fire up. 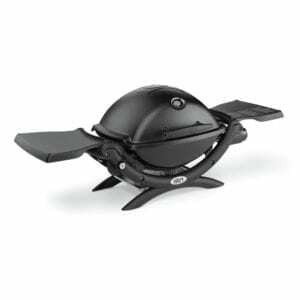 Learn more about the Weber Go Anywhere Grill here. Here’s another very capable portable grill in this segment. This is perfectly safe for using outdoors. Though it is not as lightweight as you might be assuming, it does have a closely-packaged design that can snugly fit at the back of a car or RV. The cooking output of 8500 BTUs is quite remarkable for a portable grill. It boasts of a robust cast aluminum design. This not only adds to the portability of the equipment but also guards it against weather elements. The porcelain enameled cast iron cooking grates spread the heat uniformly all over the cooking surface. The burner can rake up to 500 degrees with ease. Apart from searing and roasting, you can also bake beans, make pizza and grill the bacon until crispy. The 189 square inches cooking area will let you cook hamburgers, lamb chops and beef steaks for 3-4 guests in a single cooking session. For couch potatoes like me, the electronic ignition system is a huge plus-point. You don’t have to worry about carrying along lighter fluid. You can just set up the grill anywhere and get started with BBQ anytime. The quick electronic ignition button. Fold out shelves are very flimsy. A bit tricky to attach the propane cylinder. Learn more about the Weber Q-1200 Grill here. Weber’s Deluxe charcoal grills have been a rage since the time they were first introduced in the market. Its one-touch gas ignition system makes lighting up the burner a matter of a few seconds. No need to soak up a paper in a vegetable oil or procure lighter fluid. It has a primary cooking surface of 363 square inches which is wide enough to cook a spread for a group of 7-8 people in a single grilling session. 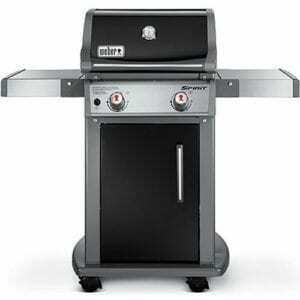 Like all Weber grills, this one is also made from a rust-resistant, heavy-duty stainless steel. In addition to that, it comes with waterproof carts as well. Love the charcoal-grill marks on the grilled meat? Weber’s signature Gourmet BBQ system cooking grates enhances the flavor of the dishes and the meat turns out tender and juicy every time. When you flip the steaks after grilling for a minute, let it cook for another minute and you’ll see the diamond marks on the grilled delicacies. In case you want to be a bit experimental with your cooking style, you can try out indirect grilling. There are two separate charcoal trays that will help you create different venting zones for this purpose. You will also find a built-in thermometer that’ll allow you to set the right temperature for roasting, slow cooking, and searing. Special Gourmet BBQ system cooking grates made from top quality iron. Comes with an in-built thermometer. The little bottle of liquid propane will be finished after rough 4-5 cooking sessions. The refill bottles are quite expensive. Learn more about the Weber Performer Charcoal grill here. 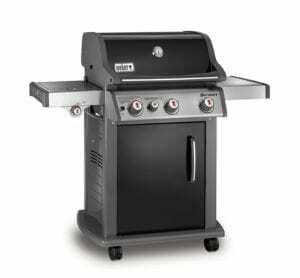 Weber Spirit edition propane gas grills are both easy on the pocket and deliver quite a decent performance. The E210 has a massive cooking output of 26,500 BTUs. This is accompanied by a cooking area of 450 square inches. What I feel is the key feature of this model is the electronic ignition push button. Just a mere push of a button and it yields the maximum heat setting within almost 10 minutes. This model Weber’s take on its own 2013 model of the same name. The new version has a number of new features to make bulk cooking easier for even amateur cooks. The porcelain powder coated stainless steel frame looks sturdy and can effectively combat rust, scratches, and damages from grease dripping. The Flavorizer bars, which is actually the brainchild of the brand, acts as a protective shield against flare-ups. It also vaporizes the fat and juices dripping from the searing meat. The excess grease swiftly slides away through the grease tray. With the remaining portion, the bars add mild smoky aroma to the meat. Whatever you grill will turn out succulent and extra tasty at the end of the cooking. With the help of basic tools, you can assemble the unit in less than an hour. Takes a bit longer to heat up than comparable grills on the market. Lid is painted not porcelain enameled. Learn more about the Weber Spirit E-210 here. If you are looking for a more powerful and larger BBQ to cook for a larger sized family, this one deserves a look.Its output of 38,000 BTUs will help you with bulk cooking. Along with the main burner, it has a side burner as well. You can use it for caramelizing onions, toast buns for the hamburger and many other additional tasks. Just make sure to keep a safe distance from it as the side burner becomes really hot in a short time. The heavy-duty casters are armed with two front locks. If you are going to install the grill outdoors, this feature will come really handy. The ignition button makes firing up the burner a cakewalk. But from a premium model like this, you expect some more advanced features, don’t you? It offers multiple temp setting and has a heat control valve to help you set any temperature you want for the particular dish you want to make. The average setup time for a grill like this is less than two hours which is another big perk. Easy heat adjustments and multiple heat settings. Flavorizer bars help to add subtle smoky aroma in the meat using the juice extracted from the meat itself. Be extra cautious with the side burner. Learn more about the Genesis E-330 grill here. 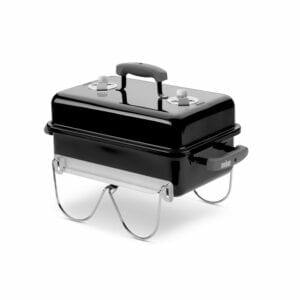 This product is hailed by many gastronomy experts as one of the most versatile grilling equipment of all time. To suit your ever-evolving cooking needs, it is equipped with 6 burners and an infrared rotisserie burner located at the back of the grill. This is ideal for roasting chicken, lamb, pork and turkey. The smoker burner is a unique addition which allows you to add a nice, smoky flavor in the meat, veggies as well as pizza. The 9 mm steel rods create those neat grill marks on the meat chunks, making them appear more appetizing. The burners heat up almost instantly and spread the heat evenly all over the cooking area. It has an illuminated grill out handle to shine a bit more light on your BBQ at night. One of the best features of this edition is that the grills are available in both natural gas and liquid propane fueled versions. You need not worry if you don’t have access to natural gas. Ideal for large families and friends. Extensive set of additional features not found in other BBQ’s. A very big barbeque grill that weighs around 300 pounds. Learn more about the Weber Summit S-670 grill here. Weber has a massive collection of grills. From humble yet high-performance portable grills to giant grills with multiple burners, the options are virtually endless. This list comprises of at least one suitable model for every budget group and cooking demand. Hopefully this article will help you select the best BBQ for 2017 without too much effort.